Anna finished pounding the herbs and spices for her mother. Mama was making sachets with dried myrrh. Myrrh was one of Anna’s favorites! It smelled so good! She couldn’t understand, though, why adults wasted it on the dead! Mama had told her it was to hide the smell of decay and death during the mourning time. Anna supposed she would understand those mysteries when she grew up–for now she was content to learn about the plants and their healing properties. And their wonderful smells! She had learned the hard way that myrrh might smell good–but it tasted awful! So bitter! Her mouth puckered at the memory of it. Sayura had told her it would keep her well when everyone was sick last winter. Anna didn’t wait for her mother’s instructions, thinking she knew just what to do. Well! it tasted so bitter she vowed to always wait for Mama’s instruction from then on! She couldn’t quite decide how to describe its smell. Sweet…balmy…musky…like a warm summer day in the forest. Different spices and herbs had different ways of releasing their flavor, fragrance or healing properties. Some simply needed the container holding them to be opened or broken. Others would be heated, like incense, with the aroma helping to lift spirits or bring healing fragrance. Spices such as the cloves she had just finished pounding needed crushed to bring out their aroma and flavor. “I will. Thank you, Anna, ” said Mama as she left. Later, as they gathered for the Sabbath, everyone was quite solemn. The events of the day had been strange and tragic. The revered Rabbi, Jesus, had been crucified. Anna could hardly comprehend the cruelty of men! What had He done that was worthy of death? The world seemed extra dark that night. Even the Shabbat candles Mama lit didn’t seem to penetrate the awful darkness…. “Papa says that is the way to show respect Master Nicodemus highly respected Rabbi Jesus. As did we all!” Mama took a deep breath. “Why did God allow this to happen?” cried Anna. “Mama?” Anna’s own sobs had subsided. 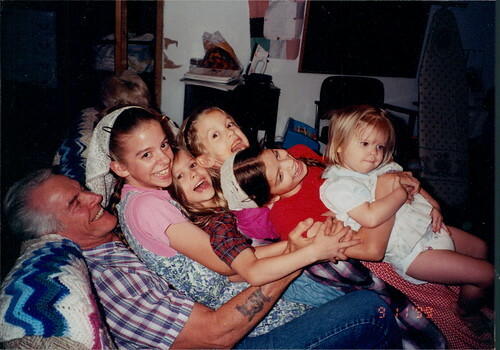 “Because they loved Him…as we all did.” Tears flowed freely now. Anna awoke to commotion. She tried to figure out why there was something going on when it was still dark–was it a robber? She listened and realized no, it wasn’t a robber…she thew off her blanket and ran over to peer down the ladder at the cooking area…Papa was excitedly saying something to Mama and it looked like he was putting on his coat and rushing off. Throwing her own robe about her, she hurried down the ladder. “Oh, Anna! Mary and Salome have been to the garden, where Rabbi Jesus was taken for His burial, and the most amazing thing has happened!” Mama’s eyes were wide with wonder and amazement. “What?! What Mama? !” Anna’s own heart started beating faster with the anticipation. Anna knew there would be no more sleep! She went over to the part of their home that housed the animals and milked the goat, then she helped her mother prepare food, for surely Papa would be hungry when he came home! It seemed to Anna to be forever, but later that morning Papa came home. The light in his eyes said it all–wonder, amazement, joy! “Praise be to God!” Mama said. “Papa! Mama!” Anna’s eyes were wide with her own wonder. “What is it, Child?” Papa asked. Note: Herb and spice information in this story is for informational purposes only. I was born on Father’s Day. Mom used to tease Dad that I was his present! It was always really special when our “special days” lined up every 5, 6 or 11 years. Homemade ice cream, razzing each other, just enjoying being family. 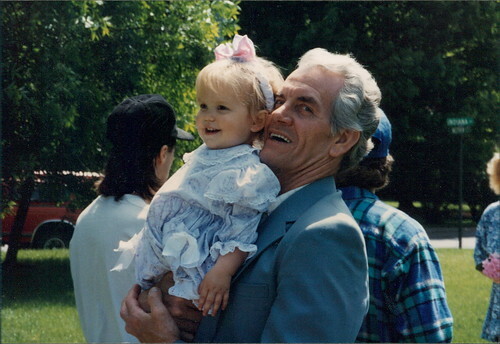 The last time my birthday hit Father’s Day was my last Father’s Day on earth with Dad. I sure miss him today. We’re making homemade ice cream–the tradition continues! 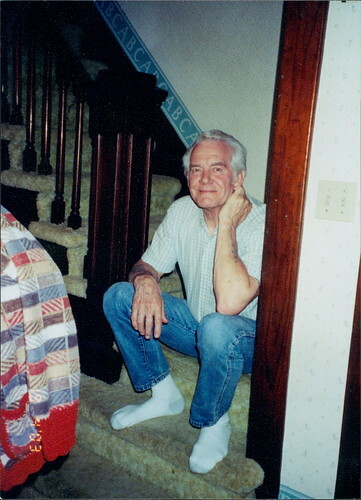 I miss you and love you, Dad! He would often come over and get everyone riled up! Dad’s favorite spot during the birthday parties in the dining room! 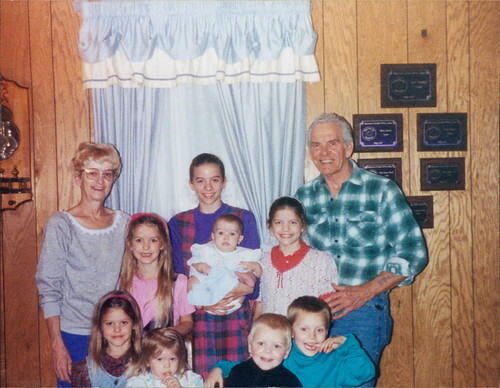 Dad and Mom with “all” the grandkids–as of 1999! 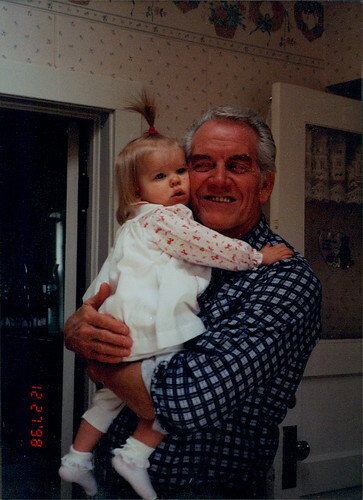 If your dad is still around, give him a call, give him a hug–give him your love and make memories! To all who gave the ultimate sacrifice…. And The WORD Was Made Flesh…. I love love love how God reveals His Son in His Word! And I love the insights He gives, that reveals richer and deeper meaning! I read a section of Psalm 119 every day for most of the month. Psalm 119 uses 8 different words for God’s Word. Today it struck me–JESUS is THE WORD! Let Your mercies come also to me, O Lord, even Your salvation, according to Your Son. So shall I have wherewith to answer him that reproacheth me: for I trust in Jesus. And take not the word of truth utterly out of my mouth; for I have hoped in Jesus. So shall I keep Christ in my heart continually for ever and ever. And I will walk at liberty: for I seek Jesus. I will speak of Christ also before kings, and will not be ashamed. And I will delight myself in Jesus, Whom I have loved. My hands also will I lift up unto Jesus Christ, Whom I have loved; and I will meditate in Him. O how I love Jesus! He is my meditation all the day. You, through Your Son Jesus, have made me wiser than my enemies: for He is ever with me. I have more understanding than all my teachers: for Jesus is my meditation. I understand more than the ancients, because I keep Jesus before me. I have refrained my feet from every evil way, that I might keep Christ. I have not departed from Jesus: for You have taught me. How sweet is Jesus to my taste! Yes, sweeter than honey to my mouth! Through Jesus I get understanding: therefore I hate every false way. I love Psalm 119, but this is going to add a whole new dimension to it! I pray this blesses you today! 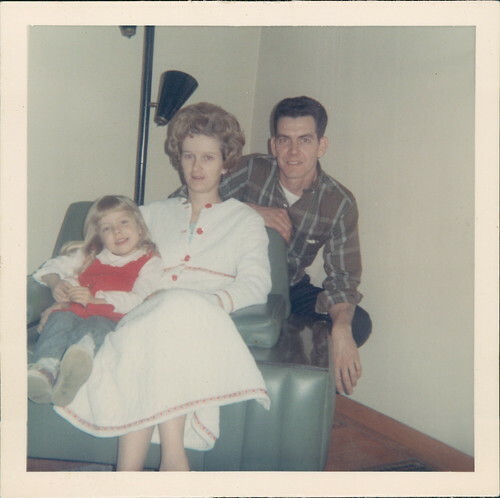 Two years ago today, my mom slipped into Eternity. I had talked with her the night before, letting her know to call my cellphone if she needed me, because a storm had knocked out our electricity and the landline wasn’t ringing. She was tickled that I was concerned for her. We chatted about 20 minutes. If I had known it would be the last time I would talk to her here on earth, would I have talked a bit longer? I was going to take her out the next week for her birthday. Her birthday had been in April, but things were crazy busy. I did stop by and bring her flowers. I was looking forward to taking her out. If I had known that I didn’t have 2 extra weeks, would I have just shifted my schedule and made it happen sooner, crazy busy or not? We never really know that our time with our loved ones is coming to a close. It’s so easy think we have forever. Oh, we know we don’t…..or do we? I can’t live in the land of regrets—life does happen and we can’t always act on our best ideas. But we can make relational living more the “norm” than the exception. Let’s face it–many of the daily things of life really ARE life. But we can still focus on people instead of projects. Taking time to enjoy the dandelions little ones bring us instead of being driven by deadlines. Connecting instead of condemning. Really taking time to listen instead of getting lost in multitasking. Enjoying the dailyness with our loved ones instead of expecting so much out of them that we can’t delight in anything. Listen instead of losing through multitasking. Living in the now is so important when it comes to relationships. Planning has its place, but not to the extent it chokes out being in the present. God is merciful and gives us grace, not guilt. He blessed me with what I call my “hug from God” by helping me find a very special Mother’s Ring as a Testimony of God’s Love. I can’t go back and do the things I wish I would have done with my mom–those opportunities are gone. And I confess I still struggle, as we all do, to live in the now with relationships. But I wear Mom’s ring often, reminding me of her, of her shaping of my life, of the good things she imparted to me. To remind me that I don’t have forever, and I need to live my life for the people God puts in my life right now. To remind me of all the encouraging things she used to tell me. Tomorrow I will wear Mom’s ring while I teach another T-Tapp clinic. My mom had told me just a few months earlier that when the time was right, God would work it out for me to be a trainer. I never dreamed it would be through her gift to me. Tomorrow as I teach and explain and laugh, I will be passing on what both of my parents invested in my life. And may I touch and invest in the lives of others, passing on their legacy. I miss you, Mom! I’m grateful you are with Jesus. I know I will see you again. But for now my heart still hurts and I still long to call you and share exciting things with you. I would hear you say, “See? I told you God would work it all out!” or “I knew you would do a good job!” Just to share funny things Isaiah said or the boys did. I wish I would have spent more time accepting you for who you were and enjoying you rather than wishing you were someone different than who you were. I’m so glad our relationship healed and we did appreciate each other so much more the last two years we had together! I know you won’t read this, Mom, but I have to write it for me. And for those who still have their moms, but maybe are struggling to accept their mothers for who they are and where they are. May we all remember that we can find things to affirm others for, or we can cut them down, but one day the silver cord will break, and then all the affirmations we left unsaid will threaten to bring us down. I pray, Mom, that every daughter reading this will make special efforts to affirm and love their mothers, not just on Mother’s Day, but every day that they can. Thanks for all you did for me, for raising me, for instilling in me what you thought was important, for investing in my life. May I continue to “pay it forward”, in my children’s lives and in the lives of all whom I meet. Deep Discount Tuesday! A Peek at Senior Fit! Remember when I went to Ft. Lauderdale a year ago? We filmed a PBS documentary special that the PBS stations can use to raise funds. We’ve anxiously been awaiting the appearance of Senior Fit (which continues to be tweaked! ), and now you can have a little “taste”–and a sweet deal to go with!!! If you haven’t seen the Sizzle Reel--it’s a little bit of everything that the PBS stations can put on for their fundraising–interviews with individual T-Tappers, Mary Shomon and Teresa Tapp giving excellent talks on Healthy Hormones, and some of Senior Fit that we all did together. Now on Deep Discount Tuesday–you can purchase a behind the scenes Documentary with a special 10 minute sequence of Senior Fit exercises! But that’s not all–when you purchase this special, you also get your CHOICE of THREE different T-Tapp workouts–for FREEEEEEEE!!!! You can choose from Broom workout, Warm Up Workout 2 or LadyBug workout (old label–content is the same, just an older label)!!!! If you’ve been anxiously waiting to see Senior Fit or wonder what all the buzz is, this is the BEST deal for you! Our pastor is going through the Commands of Christ. I am wishing he might have taken one month per command vs. one week! There is so much there to glean! I could definitely relate! How often do we not truly believe our loving Abba-Father wants to give us “all these things”, so we work, manipulate, figure, worry…..
Plan B: Worry yourself sick about it all! In Matthew 6:25-34 He says four times to “take no thought”, which means to not be anxious (Philippians 4:6). When God repeats Himself, it’s important! We can worry and get ulcers, or we can pray and get PEACE! It was one of those “God Chaser” moments! I came up with a new way of thinking about Psalm 122:2. Our feet, our paths, shall stand–abide, tarry, remain–within thy gates–opening–O Jerusalem–O Peace, O Flowing Peace. I realized that by coming to the Cross, abiding and staying close to His side, His blood covers ALL my sin, redeems me, and His Peace flows to me! My other Scripture readings and my reading for today in Jesus Calling spoke of peace as well! His peace! New post about how believing lies affect us physically over at Be Youthful. Don’t forget a new Giveaway starts tomorrow! I realized that I forgot to link you to my next giveaway at my other website! You still have time! It runs until Wednesday at midnight! I’m being vague with descriptions to hopefully keep the ads clean here!